When I first developed my recipe for meatless chili many years ago during one of my vegetarian periods, I just called it Vegetarian Chili. But when a meat-loving friend who had expressed his doubts that it could possibly be any good at all declared it delicious and said he didn’t even miss the meat, I renamed it Won’t-Even-Miss-the-Meat Chili. A big pot of chili is great for feeding a crowd. Set up a chili bar where guests can choose their favorite garnishes. Offer guacamole or diced avocado, sour cream, shredded Cheddar and Jack cheese, sliced black olives, diced onion, sliced green onion, shredded cabbage or iceberg lettuce, cilantro, lime wedges and thinly sliced radishes. If you’re not vegetarian, you could even add shredded beef to your chili bar for the die-hard carnivores. But when I was a vegetarian, this was the one dish I could count on to satisfy even the most carnivorous of my friends! No longer vegetarian, I still enjoy meatless meals often. Just add a salad (maybe this Broccoli Salad) and some Cornbread, and you’re all set. You can use info from my Slow Cooker Pinto Bean post to adapt this recipe for the slow cooker. 2 Bring to a full rolling boil, boil for a minute, then reduce heat. Simmer, partially covered, for about 2 1/2 hours, adding salt during the last 1/2 hour. And don't bother skimming off the foam that will form on the surface. A lot of people do, but I consider it just a waste of my precious time. 3 During the last 45 minutes, make the sauce. In large skillet or 3-quart saucepan, heat oil and cook onion, celery and green pepper until softened, about 5 minutes. Stir in tomato paste and seasonings, and cook for about 10 minutes to "brown" the tomato paste and toast the spices (mixture will be very thick). Add diced tomatoes. 4 Simmer, stirring occasionally, for 30 minutes. If the beans aren't tender by the time the sauce has cooked 30 minutes, turn the heat off under the sauce, cover and let stand until beans are done. 5 Add sauce to beans. Simmer, stirring occasionally, for 30 minutes or until the chili is the consistency you like. Taste and adjust seasoning. Ladle into bowls and serve, offering assortment of garnishes. Can be made a day or more ahead--it just gets better! Note: I made those fettuccine-like shreds of cheese with my Microplane Professional Extra Coarse Grater! Color me “die-hard carnivore.” You might try it with pecans thrown in or even shrimp. I call it the “La Brea tar pits chili,” on account of you can toss practically anything in there and it stays mixed and assimilated. Of course, the most important thing is a good sauce. Tomato sauce in the processing, particularly with lots of sliced mushrooms, is fundamental to the simmering stage, but something discretionary at the eating phase is a wildcard. A recent one for me is a vinegar and mustard barbecue sauce – Archer Farms (Target’s – pronounced “Tarr-zhaay” here in Mini-snowda). Your bowl of meatless chili looks incredible, Jean! With all the kidney beans and the spices, I'm sure I wouldn't miss the meat, especially with some cheese on top! Sully, I don't mind a touch of "barbecue" flavor in a bowl of beans, meaty or meatless; but to my mind, that isn't chili, it's what I call barbecue beans. You've got me wondering about mushrooms now - I've never put sliced mushrooms in chili, but why not, I love mushrooms! Thanks, Kitty. I think almost everything is better with cheese on top! Which is the primary reason I have not tried veganism. A perfect meatless meal, Jean. Oh this sounds fabulous, Jean! I love to have meatless meals at least one evening a week, and this is going on my 'to make' list!! 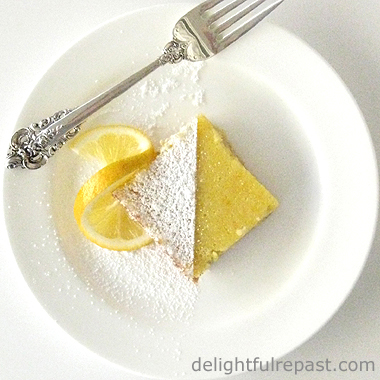 I'm sure many will love this recipe suggestion! That's made me hungry again. I'm definitely a meat eater but I do eat far more vegetarian food than I used to and this would certainly make me very happy. In England we've seen something of a rise in the profile of the 19th century Henderson's Relish from Sheffield as an alternative to Worcestershire sauce since it doesn't contain anchovies and so is vegetarian. This has led to outrage among some Yorkshire folk who think their traditional relish is being appropriated by 'southern softies'. Personally, I often add a little mushroom ketchup to chili just to confuse the issue. Thank you, Lisa, I hope you will try it. Do let me know how you liked it (or not!). Debbie, thank you. And please do come back and let me know how it turned out for you! Thank you, Jan! I do like to pack a lot of vegetables into things, since I'm into nutrition and all. Thanks, Karen! I'm a real bean fan! Phil, having grown up with Lea and Perrins Worcestershire Sauce (never saw it at any of my friend's houses), I was horrified when I learned about the anchovies during my first childhood brief vegetarian period of my life but kept right on with it afterward! We didn't have Henderson's Relish (this is the first I've ever heard of it! ), though my grandmother must have known about it. Now I wonder if she simply preferred Worcestershire, or was she making-do with it because Henderson's was not available in the States. Guess I'll never know. Thanks for telling me about it! Wow doesn't that sound delicious!! I'm trying to cut down on red meat although we probably are on the low end of it anyway. I'll make this the next cool day. I like that you're starting with uncooked beans. I have a ton of them! Jean, chili is always a crowd pleaser. This meatless chili looks delicious and I will definitely try it. Wishing you a wonderful weekend! Thank you, Martha, and I know what you mean. I could easily be vegetarian, but my husband (who did give it a try for me early in our marriage for 3 months) does not thrive on a vegetarian diet. Thank you, Judy. I nearly always start with uncooked beans. I think they're so much better than canned. Thank you, Pam. I'll be making it next week and freezing some in meal-sized batches since I don't have a crowd coming. Chilli is something I love but have no recipe for making - it's just me throwing everything and anything together. Sometimes it turns out a little spicy for me but perfect for Mr Shoes, those days I add a little sour cream to mine. Mr Shoes can't tell when there is meat in chilli or not, mostly, though he claims I am always trying to "fool him" into eating healthier. Mrs Shoes, it's amazing how a little sour cream can cool off the hot stuff! Keep "fooling" Mr Shoes; he'll thank you someday! Looks yummy, Jean. And a great way to put more vegetables on the table. Thanks, Amalia. I like to put vegetables in wherever I can! What a great vegetrian alternative! Thanks, Margie! I eat lots of vegetarian meals. I have been looking for a recipe like this for awhile. It looks great , I have to try it. My hubby loves a good chili and won’t miss the meat in this one. I wonder if I can make this one in my slow cooker. 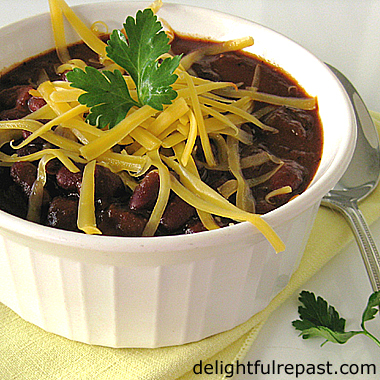 In my younger, vegetarian days, I made it two-bean chili in a skillet that was amazing! I haven’t made it in years, but I want to try your recipe! I just got some good local beans (not red kidney) and I want to try at using them. That sauce does sound delicious! I have a hard time coming up with meatless meals. This sounds great! Thanks for sharing with SYC. Gerlinde, thank you. And you just gave me a good idea -- I've added a link to my Slow Cooker Pinto Bean post to help people adapt this recipe to the slow cooker! Sujatha, thank you so much. I'm planning to pick up a mango this week so I can try your delicious lassie! Heather, I hope you'll like it as much as we do! Thank you. David, thank you. How nice to get your hands on some good local beans! Thank you, Jann. Love SYC! Hugs. Veggie chili is good! We're meat eaters, but do love veggie chili. Try making it with sweet potatoes sometime -- you'll love it! Although this looks pretty darn good as-is. Thanks! Thanks, John. I never put sweet potatoes in anything because I like them so much I put them on the side of just about anything! I'll try them with this next time. I wouldn't miss the meat either but I do like the idea of having cooked crumbled meat alongside all the toppings for those who might want to add some. Thank you, Karen. Yes, that way there's something for everyone! I love a great Veggie Chili, this recipe looks awesome! Thanks so much for sharing with us at Full Plate Thursday and have a great week! Miz Helen, thank you so much! And I love Full Plate Thursday! This looks wonderful! I love a healthy and hearty Chili recipe. Saving this for the fall. Thanks, Nicole! I was just thinking of making this later in the week.